The competition for rental properties like apartments and townhomes has become more fierce over the past decade. Even as the housing market strengthens, rental properties are still in high demand. Not only is the apartment industry notoriously competitive due to other housing options, but there is also an increasing array of choices renters have to choose from. Online research has opened new opportunities for rental properties to sell your apartment listings. 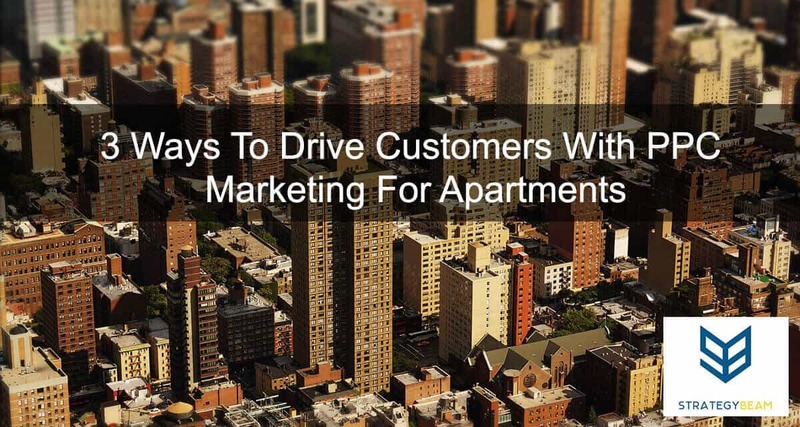 The key to increasing revenue for your apartment complex is to drive more qualified traffic to your listings. Driving more visits means that your entire online presence needs to be optimized to convert high traffic into paying renters. Google AdWords management is one of the best ways for your apartment to drive qualified leads and sign more leases. But how do apartment property marketing managers drive qualified leads to their property on a regular basis when there are several online sources for renters? The answer is PPC marketing, and today we will take a look at how you can use PPC marketing for your apartment digital marketing strategy. Working with apartment complexes across the country has shown me that apartments are one of the unique customer-facing industries out there because apartments are a hyper-local, time-sensitive, and amenity-driven product. An effective apartment marketing strategy must be focused on driving qualified customers who are looking for a new rental property within a small radius, based on elements like proximity to their job, family, friends, etc. While there are many variables that a potential renter considers, your apartment can use an Internet marketing strategy based on the strengths and unique offerings of your apartment property. By identifying the most important features that your customers want you will be able to drive more traffic and increase sales through the use of PPC advertising. It’s easy to get lost in the details of PPC management services are a great way to advertise your apartment marketing strategy. You shouldn’t set up or run your own PPC campaign unless you are confident that you can balance all the details of the campaign. The bottom line of your apartment PPC marketing strategy is how well your ads and your landing pages work together based on the intent of your customers and their search query. Here are a few tips to help you write better AdWords ads that will bring you higher Click-Through Rates, higher Quality Scores, and higher conversion rates. The only way to craft effective PPC ad copy is to understand what your customers are searching for. You are able to focus on the needs of your customers through ongoing optimization based on search queries and Google Analytics. Knowing this information provides you with an intimate view of who your customers are and what they are searching for so you can create more relevant ads and improve landing pages. Keywords are a driving factor for PPC apartment marketing and you can use that information to improve the message throughout the entire customer experience with your apartment PPC ads. One great apartment PPC marketing strategy I have found work well is to include the name of an apartment property in the PPC ad several times. This is called a Branded Keywords, and it ensures that your property will own the top listings of an apartment search. While this is an advanced strategy, I recommend you use a strong Branded Keyword strategy in your apartment PPC marketing strategy. Once you figure out what is important to your clients, you will be able to anticipate what they will search for. With this information, you can personalize your ads around the needs and desires of your customers as they search for apartment complexes. The first part of the ad clearly states that it is an apartment complex with pet-friendly amenities. The PPC ad showcases the location and nearby attractions such as the apartments being close to beaches & downtown. The amenities listed are a great use of space for information. The $500 individual really drives home the value of the location. This creates the urgency that will prompt more searchers to click on the ad and convert. Utilizing the Paths in the URL. For this one, I would recommend the apartment complex use Pet-Friendly/Sarasota or something similar. highly personalized apartment PPC ads should link to a landing page that is relevant to the message of the ad. Time is a critical factor for many renters seeking a new apartment. Whether their lease is about to expire or they are moving to a new area and need a place to call home, your customers are in a time crunch and need to find the perfect apartment now. Since you are paying money for your apartment PPC marketing campaigns, you want to make sure your ads are always current. Nothing is worse than spending money on PPC ads, but those ads are not current. This wastes money and shows that your apartment does not pay attention to details. As you can see, the apartment PPC ad says they are leasing for Fall of 2015. As of the time of this writing, it is the Winter of 2016, and about a month from 2017. I promise you that if my wife and I were searching for an apartment in Sarasota and came across this ad, we would not click on it because the PPC ad shows a date that is not relevant. The lack of attention to detail indicates that the apartment complex won’t pay attention to the small details of their ads, so why should I trust that they will pay attention to my needs while I am a renter? As a side note, it looks like this apartment PPC ad was built using the old ad style. I would highly recommend that the apartment complex recreates and update the ads in the newest ETA version of AdWords ads. This will allow them to take up more real estate while also providing more information to their audience. Apartments are a hyper geolocation product. Your audience is looking for apartments in a particular area for a specific reason as they look for specific amenities. This means that your apartment complex needs to use location as a qualifier for valuable clicks. You can also use the site of the apartment in your PPC ads several times to improve the Quality Score and relevancy score of your ads. I like to use the area of apartment complexes when creating PPC ads because it qualifies the click and helps connect the ad with the content your audience is looking for. This means that the Cost Per Click (CPC) will likely decrease as the overall quality of clicks increases. I like to use the extra area of ETA ads for an apartment because it qualifies the click and helps connect the ad with the content your audience is looking for. This means that the Cost Per Click (CPC) will likely decrease as the overall quality of clicks increases. Here you can see that the PPC ads for this apartment repeat the location several times. Headline 1 showcases the area to ensure the reader that the site is exactly what they are looking for. Since there are other Salems in the world (i.e.- Salem, OR, etc.) you want to make sure that the audience knows where the apartments are located. Using Path 1 & 2, you can create new trust by adding more location information. The Description includes the area in an organic way to help connect the place with the amenities. Using this format allows you to show the location of the apartments in the PPC ads several times, so your audience knows exactly where the rooms are located, and the overall performance of the ads should increase. You can double your geo-location efforts by combining the location in the ads with focusing on specific sites in the Settings. PPC advertising is an effective way to reach your audience while building your brand and driving qualified traffic to your apartment property website. The only way to make your money work for you with PPC advertising is to ensure the PPC ad copy is optimized for the needs of your audience and your landing pages are optimized for conversions. Use the tips that we reviewed above to improve your apartment PPC marketing strategy. If you are ready to focus on your business and not on your apartment PPC marketing, then shoot me an email today. I would love to discuss your options, review your property, and find the best PPC marketing strategy for your apartment today!